Not only do lamps and light fixtures help set the mood of a space with their light, but they do the same with their appearance. Color, scale, repetition and composition are all important factors to consider when choosing light fixtures. Whether you are a traditionalist or a radical modernist, carve out your own personal space with some creative lighting choices. For guidance I’ve assembled some interesting fixtures that I think help accentuate and illuminate rooms in very provocative ways. Drumroll. These gigantic drum shade pendants are showstoppers. 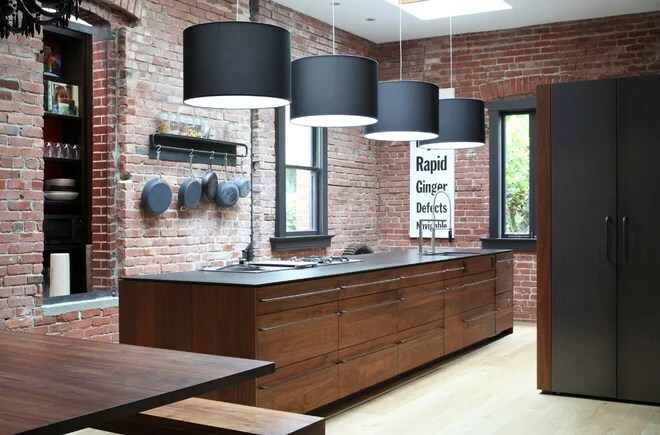 Why they work: Not only are they overscale and dramatic, but with their steely charcoal finish, they visually reference the cookware hanging on the brick wall. To top it off, they provide excellent task lighting for the kitchen island. Tiny bubbles. A hovering cloud of bubbles trapped in space, this is a modern twist on the classic chandelier. Why it works: Downlight is reflected and refracted off the glass orbs, making them appear to magically glow while casting a warm light across the faces of any diners at the table. Uplight, downlight. Simple sconces disappear when painted to match the wall. Why it works: In this minimalist space, light adds an interesting pattern to the walls in lieu of artwork or other overt decoration. Lighthouse. This ingenious column acts as an architectural beacon. 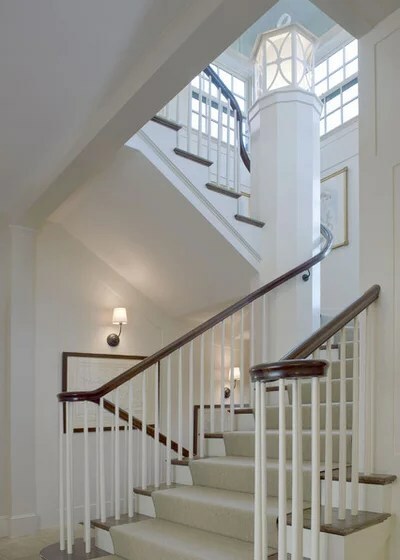 Why it works: This dramatic light is the focal point of the staircase. When it’s fully lit, the steps are flooded with light. When dimmed, it casts a soft glow that works like a nightlight to keep the staircase safe. Move over, Sputnik! This sea urchin dining fixture is a nice change from the typical Sputnik-style fixtures we see everywhere. Why it works: The bulbs are tucked among the slender rods, washing the walls and ceiling with delicate, twig-like shadows, and further enhancing the texture of the grass cloth–covered walls. Repeat after me. This pop art–style installation recalls Andy Warhol’s effective use of multiples to create drama. 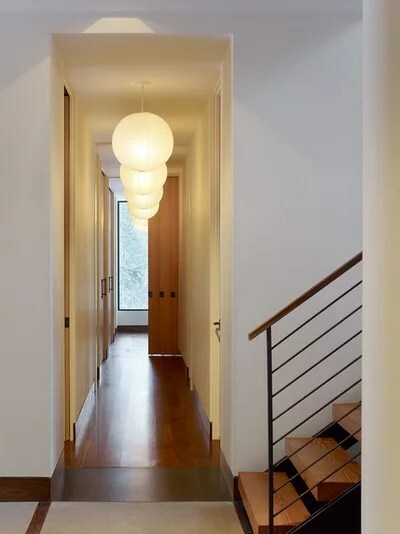 Why it works: It’s a great way to light a long hallway. Paper lanterns offer gentle illumination and are inexpensive, so using several won’t break the bank. Sculptural grouping. 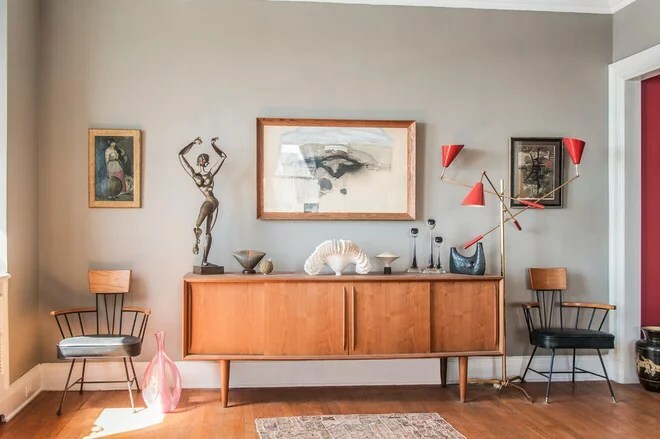 This substantial floor lamp is right at home in this living room filled with other large-scale pieces. Why it works: It’s thoughtfully scaled to the rest of the room’s furnishings. And it’s anchored as part of the composition of leather drum tables, instead of standing alone. Swing set. Tucked between three windows, these adjustable swing-arm reading lamps do double duty. Why they work: They provide nice general lighting, but are also poised to act as focused reading lamps for the overstuffed chairs below. Seeing red. Set against a pale “greige” wall and mellow vintage wooden furniture, this adjustable standing lamp packs a color punch. Why it works: The lamp provides focused light where needed, but the fixture itself is a standout. The pop of red is just what this neutral scheme needs. Hanging around. Plunging pendants are a terrific alternative to wall-mounted sconces in the bathroom. Why they work: It’s a fresher, less expected look. The pendants free up all-important wall space that can be used for hidden medicine cabinets. Hang them at eye level for proper facial illumination. Amass a collection. The three clear globes of this light fixture echo the collections displayed in this living space. Why it works: The ceiling fixture has simple, clean lines that don’t compete with the collections; it references them without calling too much attention to itself. Logroll. 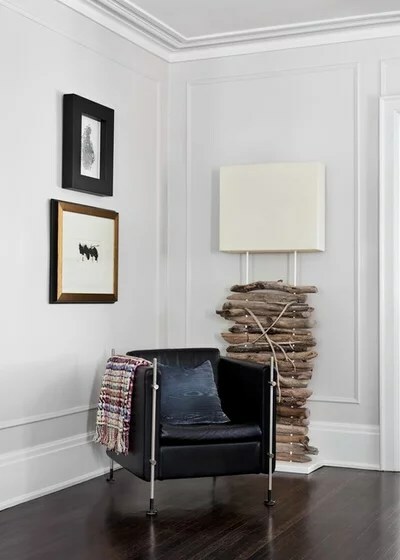 This fascinating floor lamp is a cross between a sculpture and a light fixture. Why it works: The unusually flat shade references the scale of the nearby artwork, while the base adds a wild texture to the very traditional walls, with their panel molding. By candlelight. 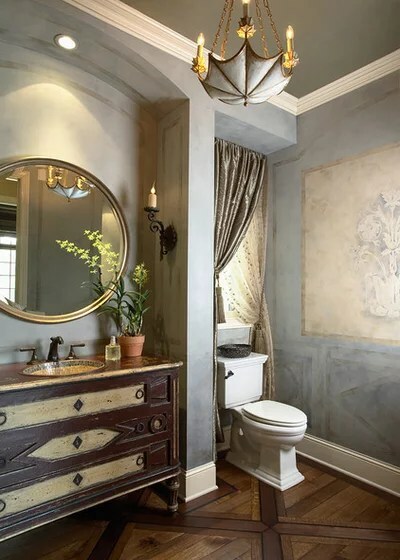 A wrought iron candle sconce by the vanity gives this bathroom just the right old-world ambience. Why it works: The low-wattage bulb dipped in silicone gives the look of an actual flame without the worry of an unattended burning candle. The birdcage. 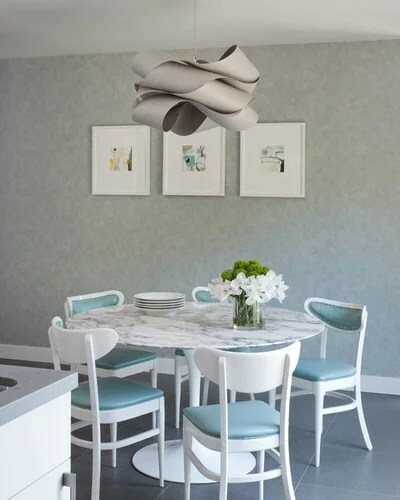 A delicate metal pendant fixture is an interesting focal point in this room. Why it works: The shadows cast by the fixture carry pattern onto the ceiling. The metalwork also evokes the filigree on the gold desk chair. Sculptural focus. 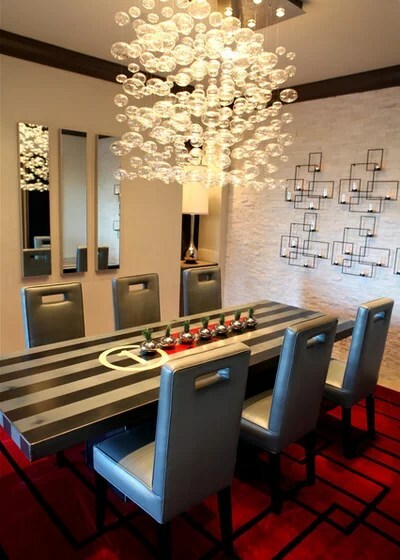 This origami-inspired lamp is a beautiful focal piece in this dining area. Why it works: When the light is off, it looks like a sculpture floating in space. When the light is on, the undulating folds capture and disperse the light in very evocative ways. In this Oregon library-turned-home, the interior designers at Jessica Helgerson Interior Design let the kitchen recede into the background and put the focus on the fantastic windows, which were painstakingly replicated from the originals. Black was used on the trim and built-ins throughout the open plan. Between the open shelves full of cookbooks and the rolling ladder, one can see the library spirit is still alive and well in the home. 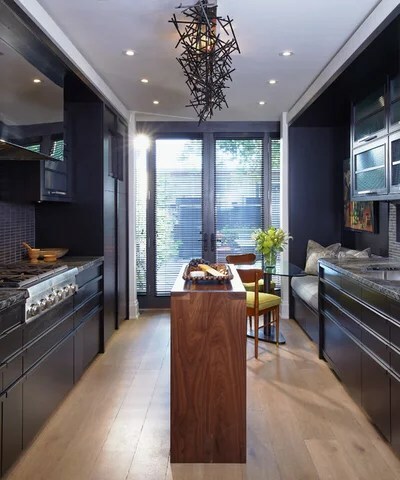 Sleek black wood-veneer cabinets and black marble countertops keep a streamlined look, while mirrored backsplashes on either side bounce the light around. Using the black created a strong contrast that doesn’t compete with the view. This black kitchen also opens to much lighter rooms with coastal views, so it recedes into the background in a sleek, sophisticated way. 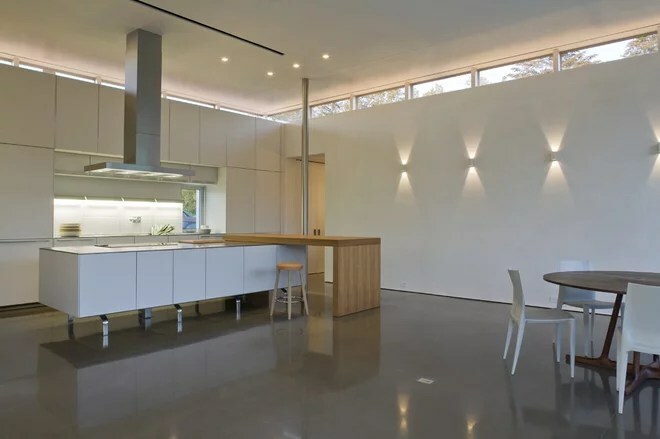 The designers at LDa Architecture & Interiors were inspired by the rocky Massachusetts coastline right outside the home when choosing the countertop. This large slab creates a stunning middle ground between the black and white. Jeffrey Douglas of Douglas Design Studio recommends making sure that a kitchen has good light showing through from different angles before going black. This kitchen gets plenty from the large windows and doors and another window in the backsplash (not shown). This is also a story of wood — the cabinets are Canadian red oak with a charcoal stain. Engineered white oak flooring, a light ceiling and a rich wood island add warmth. 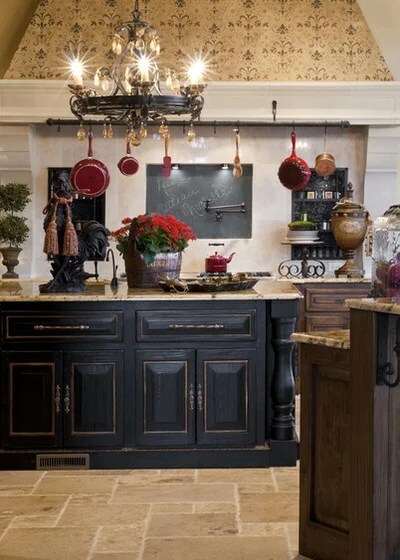 Interior designer Candace Cavanaugh specified black-brown when coming up with a custom color for these cabinets. The hue adds an unexpected warmth to the dark room. She then custom designed taxicab-yellow counter stools to add a playful dash of color. The overall look is glamorous and unexpected. Cabinet hardware: custom, Folger & Burt Architectural Hardware Inc. Renovation Design Group gave this bungalow the contemporary loft-like feel that the owner preferred. 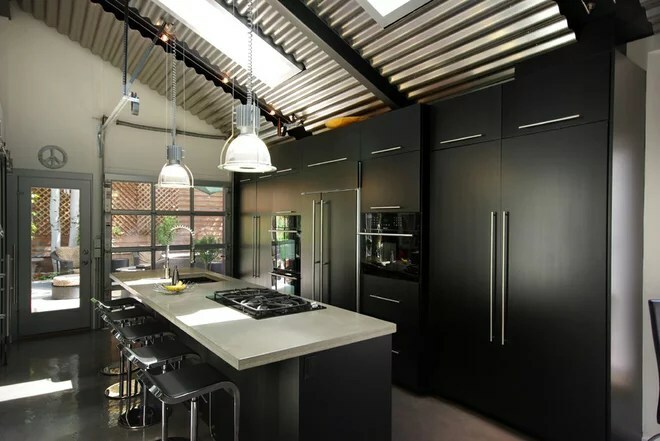 The black cabinets fit right in with the industrial-style corrugated ceiling, glass garage door, concrete countertops and stainless steel accents. 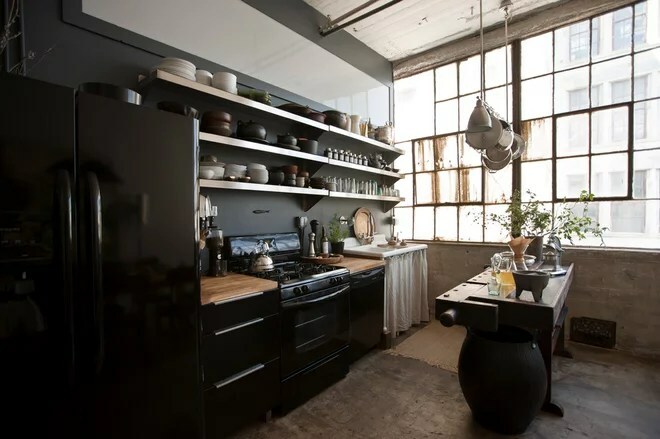 This industrial kitchen in Brooklyn, New York, used to be an industrial woodshop. Appropriately, the island is a well-worn vintage workbench. Dark cabinetry and appliances put the focus on items that homeowner Alina Preciado has collected on her worldwide travels, including spices and unique teapots. 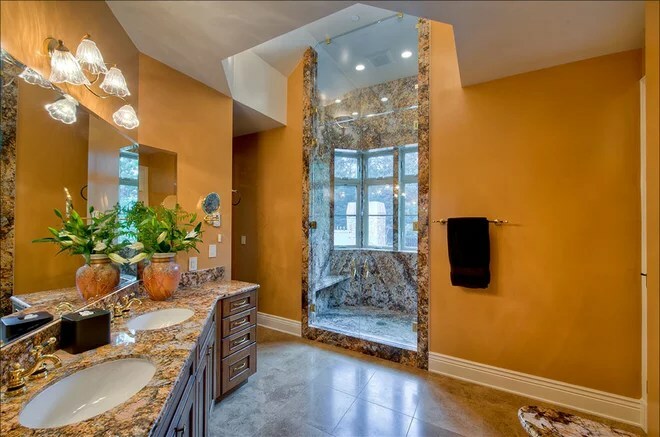 So you want all-out glamour, luxury and indulgence in your bathroom, but you don’t want it to look like the Palace of Versailles or the ladies’ powder room at Harrods? Getting the balance right without tipping over into kitsch can be tricky, but these bathroom designers got the monochrome-metallic combo right on the money. Keep it in proportion. If you’re going for gold, keep those touches to a minimum to avoid overkill. A simple gilt-edged mirror, a metal wall hanging and complementary amber touches in the chandelier are all that’s needed — and stand out all the more against the black backdrop. Deliver it through the details.With white as the main element and black as the second in this bath, the simple gold tap really jumps out, proving you can make a feature out of even your sink line. 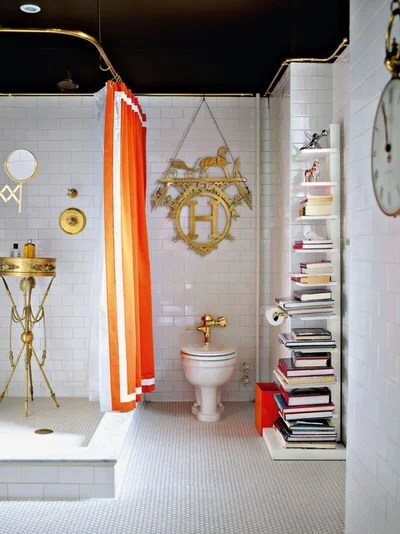 The designer wisely stopped short of a blingy gold showerhead in favor of antique brass to avoid overkill. 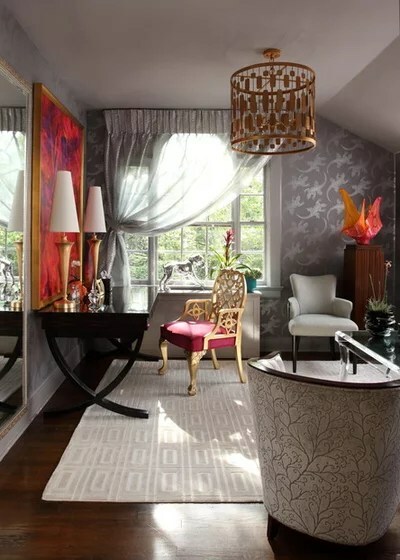 Take risks in the smallest room.The powder room or small downstairs bathroom is a space where you can indulge the most adventurous decorating ideas, such as this gentlemen’s-club look with black lacquered paneling and playful artwork. 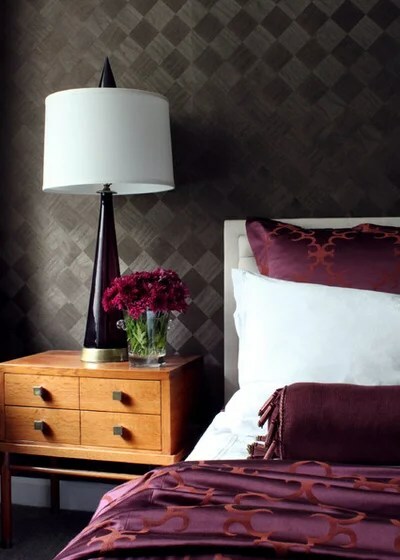 Tip: To keep a mix of metallics from seeming haphazard, consider grouping them in some way. Here the chrome fittings are kept to the the bottom half of the room, and gold or bronze to the top half. Make a statement. The feature wall of large-scale textured metallic tiles is the star of the show in this deluxe bathroom. You could also create a statement wall with metallic paint or decoupage panels with copper foil sealed with a clear varnish or lacquer. 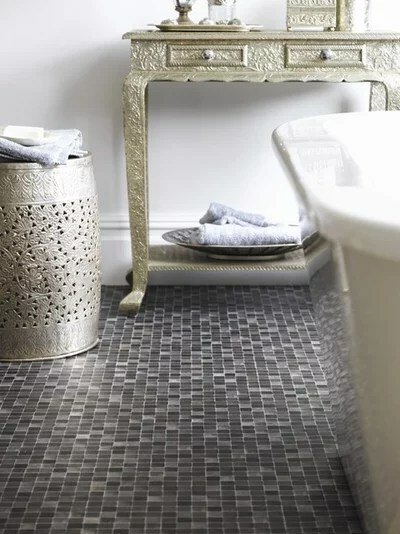 Hold on to a vacation feel.Metallics are a wonderful way to liven up classic black and white tiling. 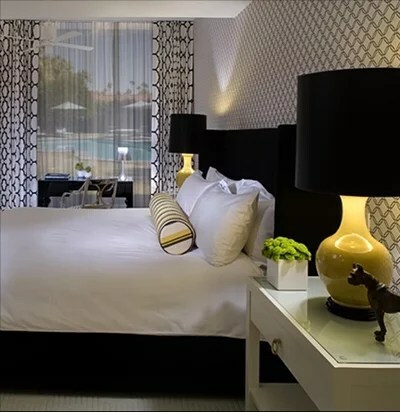 Monochrome mosaics and furniture with ornate detailing and motifs can make you think you’re relaxing in a luxury hotel in some far-flung destination. Be adventurous. 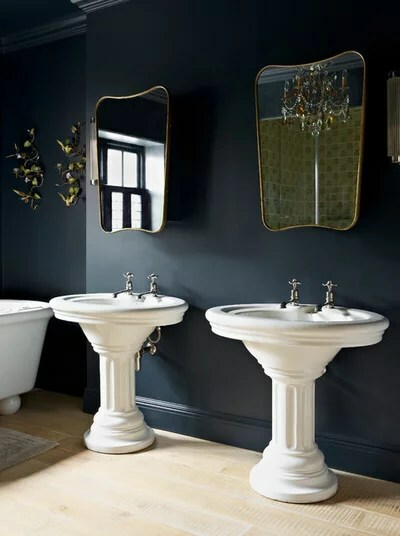 We’re used to thinking black painted ceilings belong in teenagers’ bedrooms, but this bathroom proves that the look can be pulled off with panache as long as the walls and floors are white. It’s a look best suited to rooms with high ceilings — try a stenciled gold border instead of the gold rail. Use luxury materials. 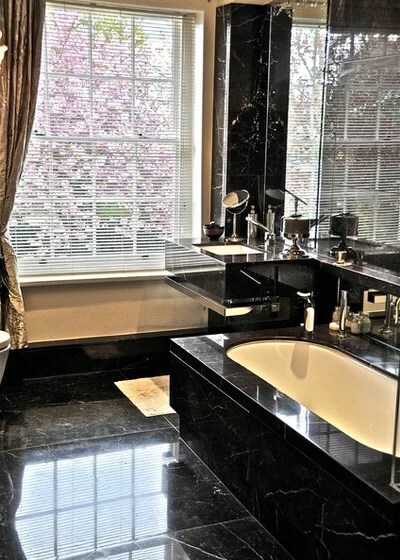 An abundance of black marble gives this stunning bathroom five-star-hotel appeal, but if your budget won’t stretch that far, limit marble to your basin and bath surround, where it will have the most impact, and economize with ceramic checkerboard floor tiles instead. Combine them with a chiffon or organza voile curtain in old gold. 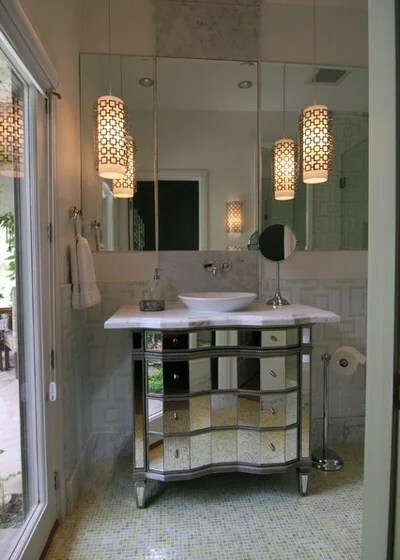 To finish off, a mirrored wall is relatively inexpensive but really delivers on the wow factor. Break up stripes. When you’re using an equal mix of black and white, it’s even more important to introduce an accent. The crisp lines of this monochrome striped wallpaper need a strong counterpoint, otherwise the room could feel too stark. Here the contrast is provided by the ornate mirror and detailed gold accessories. 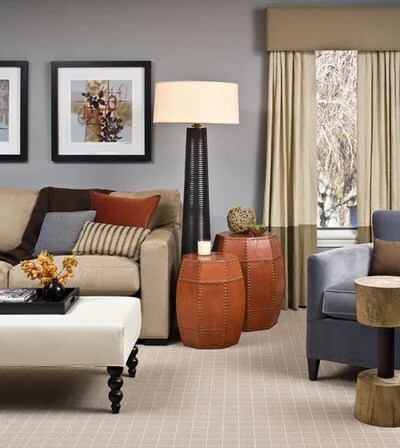 By now everyone knows that it’s pretty easy and inexpensive to switch up the look of a room by changing out throw pillow covers, a lamp or two, artwork and a rug. However, to pull this off you need a versatile base. 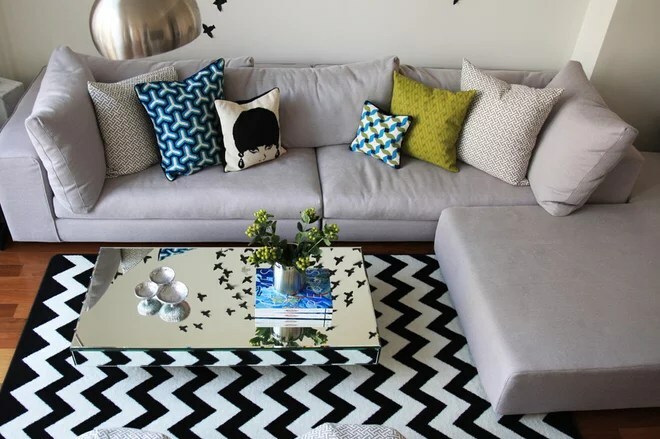 Using black and white as a base makes these switch-ups very easy and is visually striking. 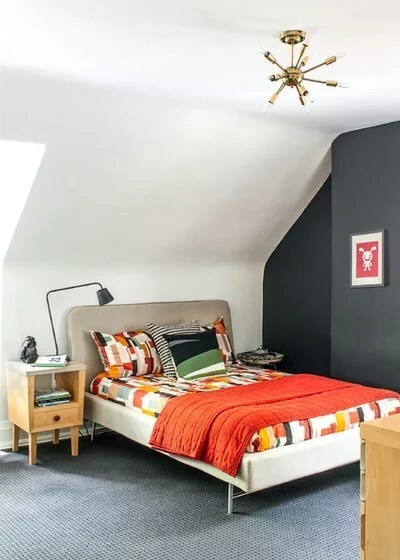 Get ideas for how to do this from these five houses that use black and white as a starting point. This balance of the two colors even keeps an over-the-fireplace TV looking sleek. 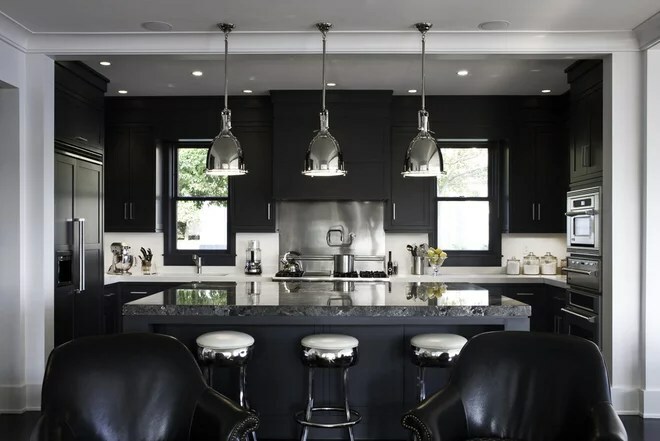 Not all of the rooms are white with black accents; others, including this kitchen, let black dominate and bring big drama. A bold Manhattan apartment. 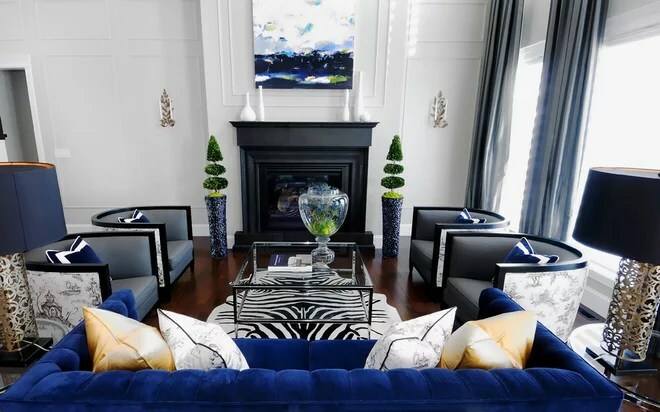 Interior designer Stephanie Sabbe created a wowing look by using black, white and shades in between (for example, the light gray sofa). 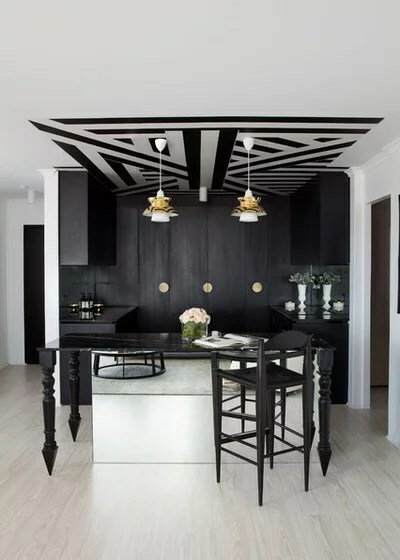 This sophisticated home starts with a strong black and white chevron rug on the floor, and graphic touches abound from the floor up to the ceiling. Another black and white rug creates continuity between the rooms; this time it is rendered in a zebra print. 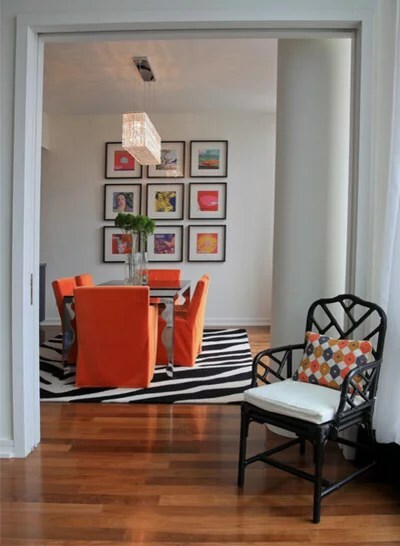 Electric orange dazzles as part of this palette, while boldly colored prints are anchored by black and white framing. 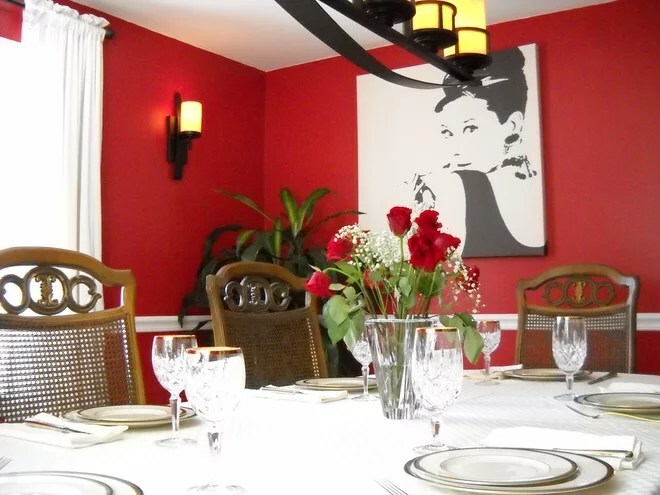 Any of the bold hues of the artwork would work well on the dining chair slipcovers. 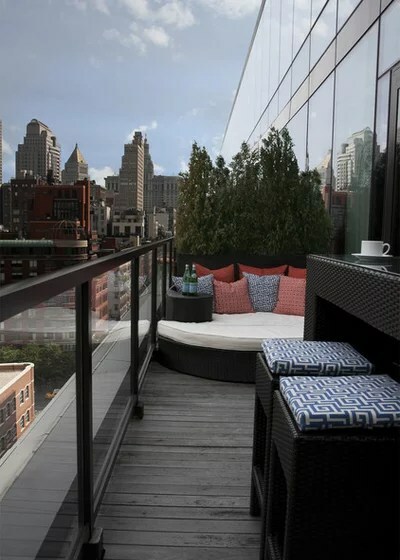 Out on the terrace, black woven furniture can take on a bevy of bold hues and geometric prints. 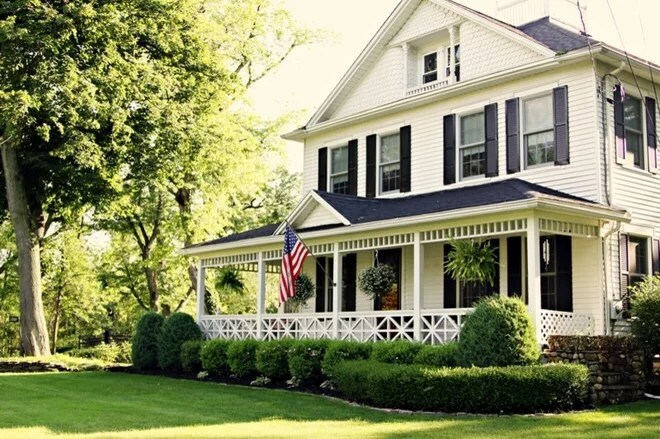 A country charmer in western New York. 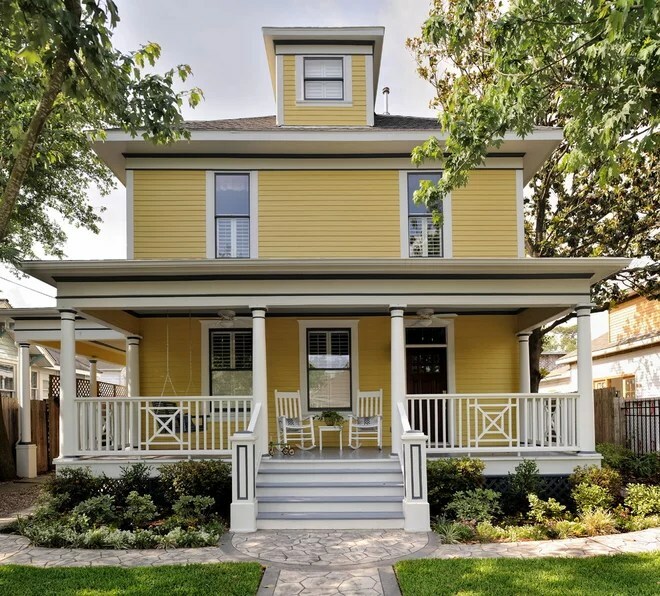 Susan Duane, blogger of Hometown Girl, has preserved the classic look of her antique home through major renovations. The use of black and white lends a crisp, traditional look. 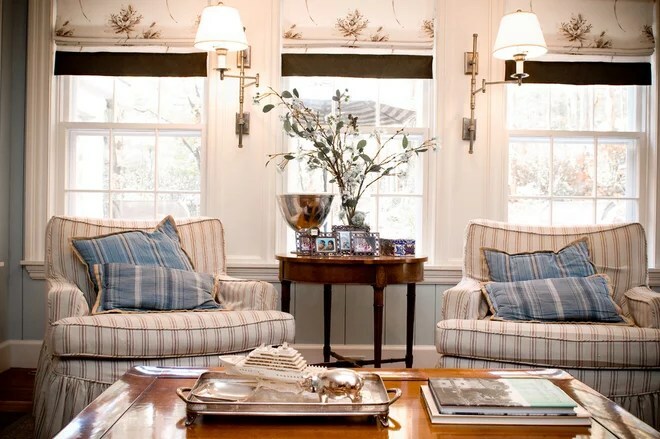 Turquoise chairs stand out on the otherwise strictly black and white screened-in porch. 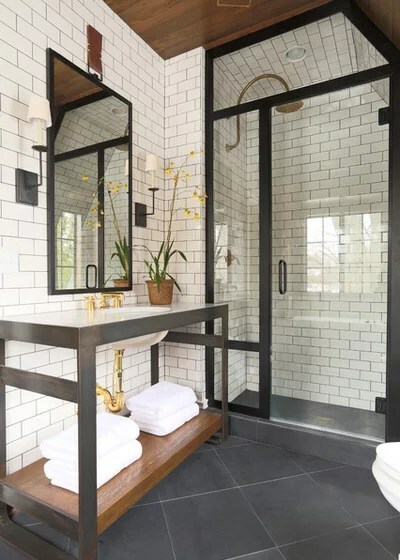 Black and white tiles on the floor and a traditional floral print on the walls and windows give this bathroom a vintage feel. A Shelter Island cottage. For this charming cottage on Shelter Island, New York, Steve Schappacher and Rhea White took a common beachy farmhouse aesthetic and switched it up by rendering it in black and white. Keeping a strict color palette ties together an eclectic mix of seating and decorating styles. 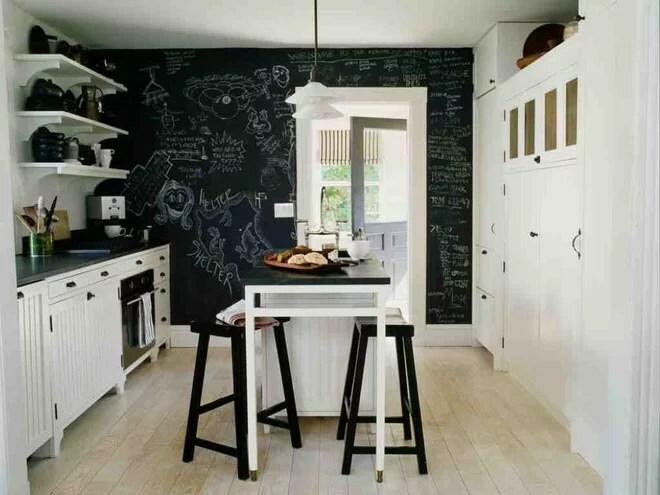 Chalkboard paint provides an ever-changing backdrop to the cottage kitchen. A contemporary box in Venice Beach. 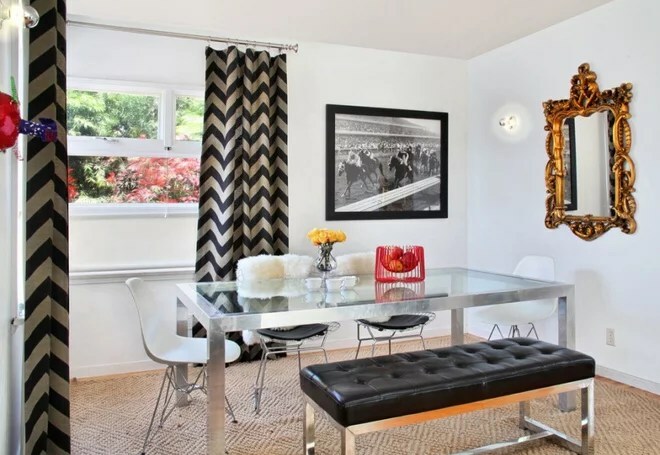 In this contemporary home, interior designer Vanessa De Vargas carries substantial black and white pieces throughout the home, often in chevron patterns. This gave her the freedom to mix in shots of bold color in every room while keeping a cohesive look throughout the entire first floor. The black and white pieces in the room work well with glass and chrome. An ornate gold mirror and a natural fiber rug keep things from being too matchy-matchy and warm up the otherwise stark palette. 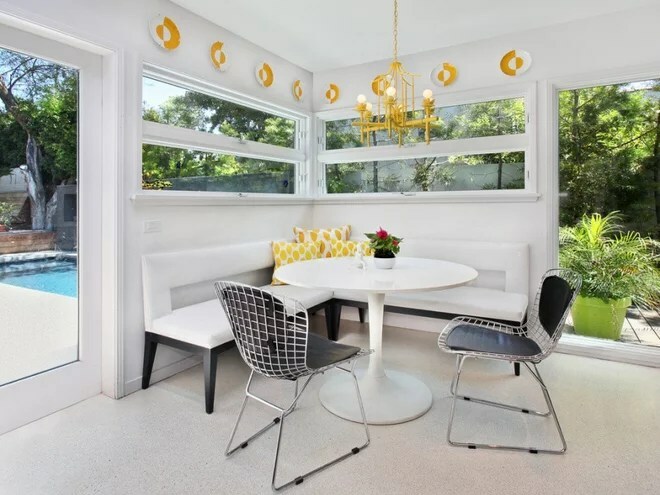 Pops of yellow add cheer to the black and white breakfast nook. The main reason a little black dress is so important in any woman’s wardrobe is that it is black. Black goes with anything, is always classy, is never out of style and oh-so-seductively hints of power. In this case what’s true in the world of fashion is also true in the world of interior design. Black is the universal color — or noncolor, as some would argue. In concert with other hues, it can provide weight, crispness, definition, relief, great style and sophistication. In fact, for years one of my design mantras has been, “Every room needs a little touch of black.” It’s like a touch of horseradish in a bland sauce — it adds just the right amount of life, without anyone’s really noticing. 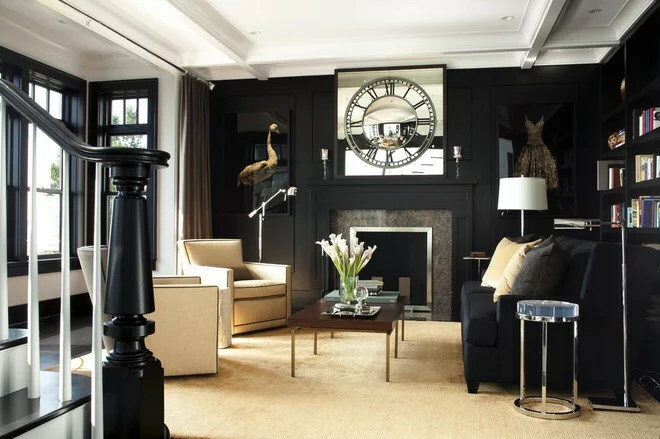 Black is not a color that needs to be repeated in a room. Just one bold accent, like this ceiling, brings the élan that only black can provide. Ditto for this black accent wall, although here the color is expertly repeated (with a very easy hand) in the fabrics and the lamp. Use your thumb to cover the black in this room. Verve and style: going, going, gone. You may use either a touch of black or a ton. Either way, your design will show the impact. 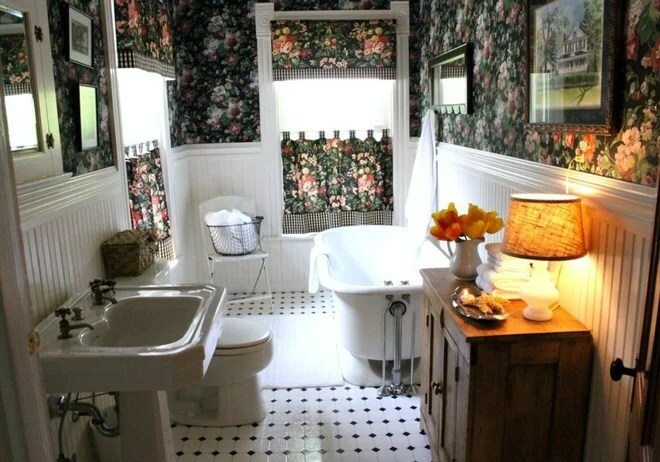 Look how the black molding and cabinetry allow the gilt-framed pictures to glow, and the stylin’ tub to scintillate, in this bathroom. The black accent trim on this home is so restrained as to be almost unnoticeable. But it brings great crispness to the palette and makes you see details that would otherwise have melted away. 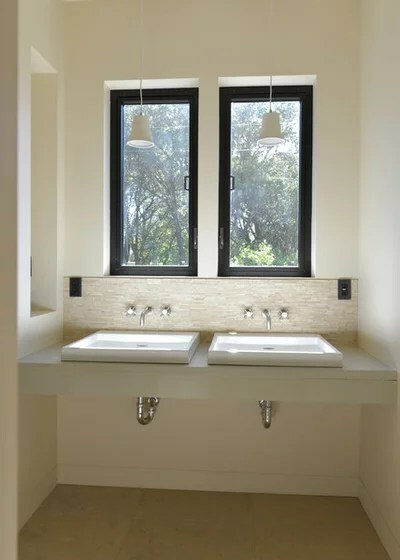 Here black is used just for the window trim (and OK, maybe the outlets) in this otherwise all-white bathroom. But it keeps the white from being stark or boring. Without the black, there wouldbe no design. This designer also opted for black trim on the windows. 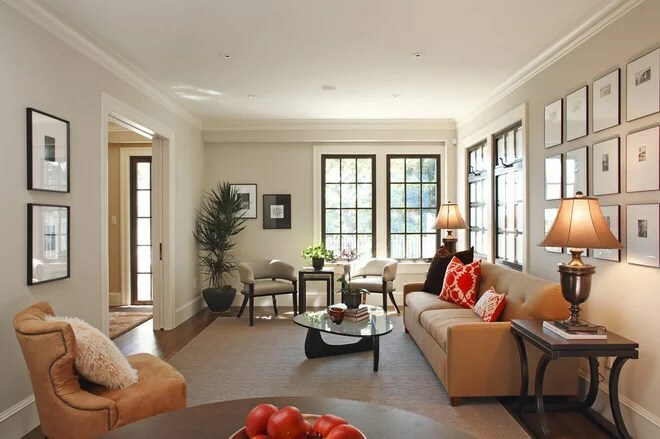 See how it gives the room a refreshing crispness and definition, making the windows pop and giving cohesiveness to the room. Tracy and Hepburn, bread and wine, Baskin and Robbins (can you tell it’s dinnertime and I’m hungry?) are classic duos indeed. But black and white simply outclasses them all. 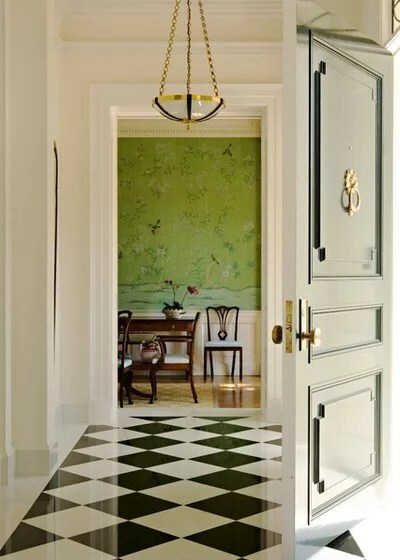 Black and white floors, whether marble, tile or painted wood, have set the standard for haute design for centuries. But notice here how the lime-green wall makes for an entirely modern interpretation. 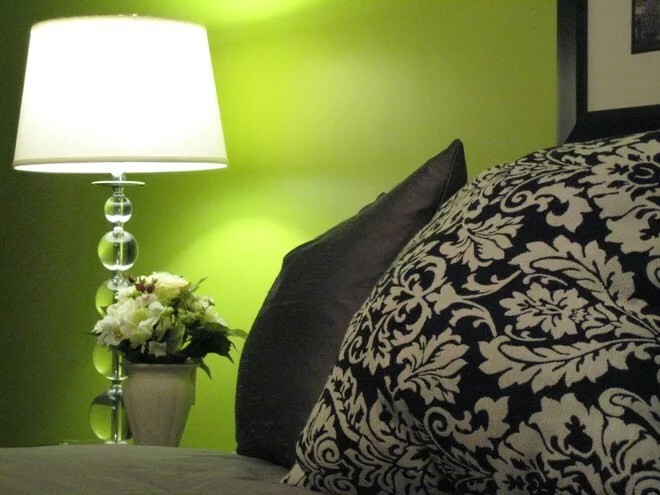 I am currently on the bandwagon for lime green and black (and not just because they’re the colors for Houzz). 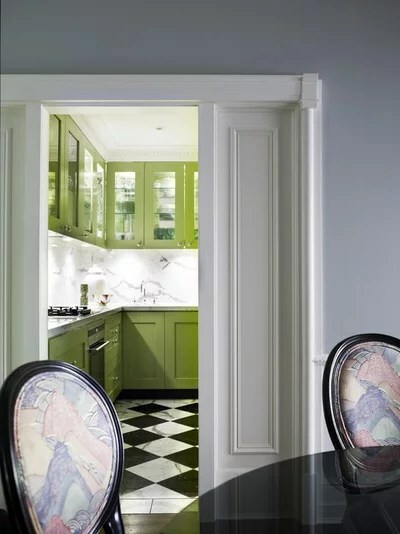 This rich combo has profuse possibilities, from spare and modern to country (think black and white checks against a lime-green floral) to Hollywood glam. The truth is, black not only contains all colors; it goes with all colors. There is simply not a color scheme that doesn’t benefit from its presence. 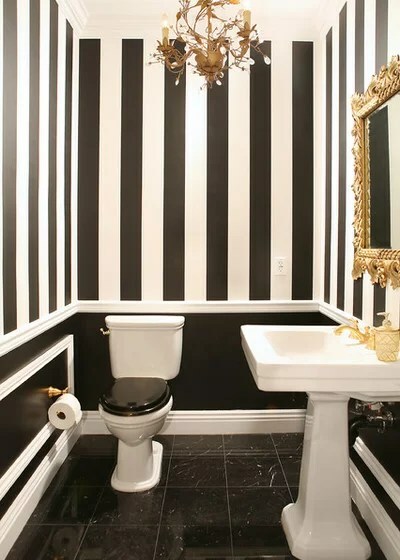 … or this Dijon-hued bathroom (where black is used only as an accessory — a great approach for people who might be shy about making the color a permanent fixture). … or mated with royal-blue upholstery. Even purple — as illustrated so magnificently by the lowly pansy — is complemented and enhanced by black. I must not neglect black and brown. While you would never pair brown shoes with a classic tuxedo, in this case the fashion rule does not extend to interior design. Think how nature has dressed the Doberman pinscher, the decidedly upper-crust King Charles Spaniel and the diminutive quail. 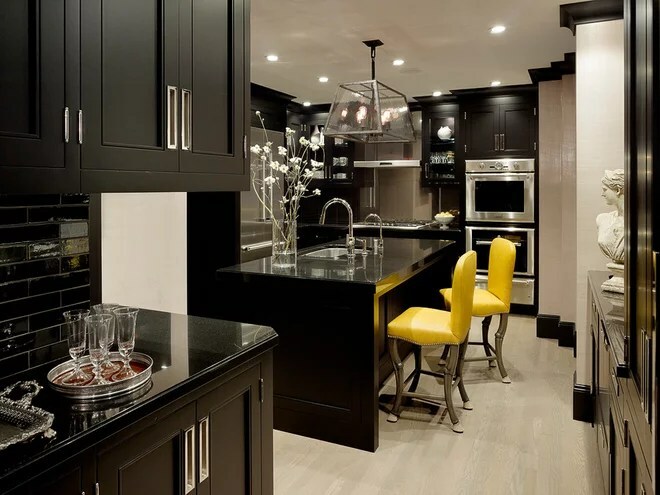 The masterful way black and brown are mixed in this cabinetry brings both warmth and depth to this kitchen, while giving it an aura of permanence. Certain shades of off-black are luscious. This yummy grayish chocolatey black is Benjamin Moore’s Black Bean Soup. 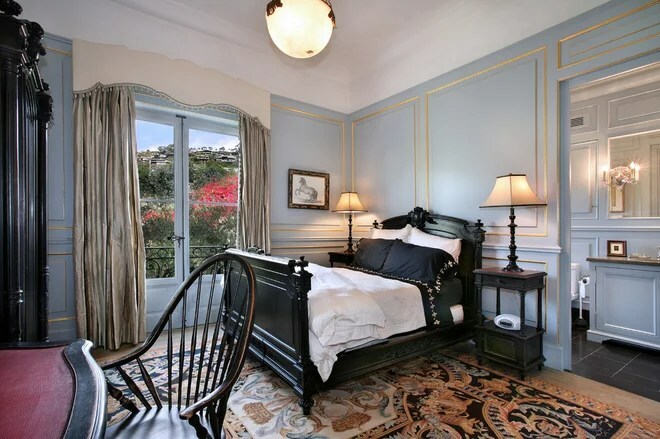 Black is really unexpected in this bedroom, with its baby blue boiserie. But it brings subtle warmth and a masculine touch to what would otherwise have been a decidedly feminine environment. Every once in a while, a design magazine heralds the advent of “the new black.” It’s a term used to describe or give merit to a color trend, as in, “Orange is the new black.” My response to such pronouncements is always to turn a chilly shoulder and harrumph. I love color, but only black accomplishes so much, with so little, so well. Special thanks to Becky Dietrich, Houzz Contributor for this amazing article!